As promoters of the Impact Investing movement, we've noticed that story telling is at the core of the movement. When we speak to people about Impact Investing, the stories behind the projects and investments resonate far deeper on a human level, than the numbers do. So in that spirit, we'd like to share a story that our CEO Steve Distante posted on Linkedin this week. 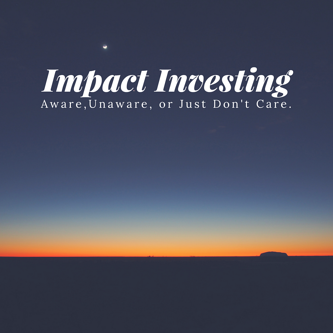 "While sitting with a new friend, a fellow Impact Enthusiast, Mike Sakraida from First Affirmative, he shared with me the 3 type of people when it comes to Impact Investing, there are the Aware, Unaware and the Just Don't Care about people or planet, just making money. We shared stories of our "awakenings" and discovering who we are and how our new passion can be very annoying to people who fall into the last category. But we shrugged it off as, "that's their choice and there are a lot more of us then them" at least we like to believe so...and as time goes on, people who "vote with their dollars" and realize that investing in companies that embrace "Doing Good" with their company will eventually, if not sooner, gain favor with investors. "Young people don't trust the stock market" was the conversation today with a younger advisor, Dock, who is exiting the industry, so I pulled out my soap box and began to share..."they need education, they need to know there are companies that embrace a culture and mission for good, impactful products or services and it is my mission to share that with them!" I think he was shifted, maybe not entirely convinced, but listening enough to at least doubt his decision to leave the financial services industry and for that I was grateful. Does Steve's story resonate with you? Have you had similar experiences? We want to hear about your impact story. Check out our online community called Impact U, dedicated to teaching Advisors, Investors, and Clients all about Impact Investing by sharing stories.